QUITO (Reuters) - Ecuador on Thursday said that Venezuelans entering the country would need a passport from Saturday, an apparent attempt to curb a rising influx of migrants fleeing their homeland. Members of the Andean Community - which includes Venezuela and Ecuador - have an existing agreement that allows citizens to cross borders between member countries with only their national ID cards. 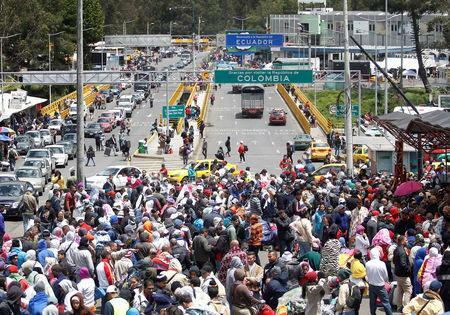 That has been a significant advantage for Venezuelan migrants, who struggle to obtain passports amid chronic shortages. "As of this Saturday the government will require that anyone entering Ecuador present his or her passport," said Interior Minister Mauro Toscanini on Thursday. The Foreign Ministry later issued a statement saying the measure applied specifically to Venezuelans, adding that their national ID cards were often deteriorated and lacked the necessary security features. Ecuador's President Lenin Moreno is left-wing like his Venezuelan counterpart Nicolas Maduro, but he has distanced himself from Caracas since taking office last year. The migration wave has also soured public opinion toward Venezuela in the country of some 16 million.